After a huge few months of training, racing and fundraising the Beast is over for another year. 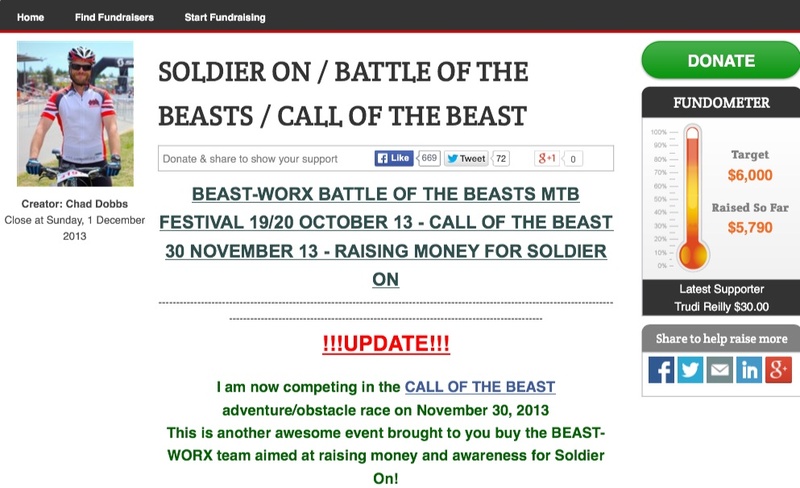 After two huge weekends, two mountain bike races and one obstacle course race my fundraising page has finally closed. Thank you to everyone that shared, followed, liked, reposted etc on social media and those that were kind enough to dig deep and donate to Soldier On. Last year, with the generous donations if my supporters, I raised a massive $5’702 to help wounded Soldiers and their families. Out if the 119 riders that attempted the race I raised more money than all of them combined, which is a testament to the generosity of my friends and family. Sunday 20 October – THE BEAST – 72km of the ACT’s most brutal and unforgiving terrain. Last year saw me, sweat, cry, swear at trees and finally vomit after I finished the race and collapsed into a heap on the ground. I NEED your support to finish this epic weekend of mountain biking! I need people to sponsor me on these rides to raise money for SOLDIER ON, a not-for-profit organisation that provides rehabilitation and support for wounded ADF members and their families. As a ex-serving member who has deployed to Iraq and Afghanistan I’ve seen the toll injuries, both physically and mentally take on returned veterans and their families, so every dollar that is spent helping these people in need is greatly appreciated. I’m asking YOU to donate money (every donation helps) to support this fantastic cause while I sweat, bleed and cry my way across Namadgi National Park.